Ex-Worthing Football Club striker Zack Newton has been tipped to star for Welling United next season. Newton, 20, agreed on a switch from Woodside Road to National League South Wings earlier in the summer. 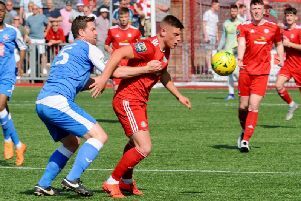 Welling manager Steve King, who's previously been in charge at Sussex sides Whitehawk and Lewes, told londonnewsonline.co.uk: "I think he (Zack Newton) has got a hell of a chance to go higher. “He’s only 20 years old and is very, very quick – he can run 100 metres in 11 seconds. “He plays on the shoulder of people and is only five-foot five or five-foot six. He is direct and can play out wide or down the middle. I’m excited about him. Obviously he hasn’t played the level but he came into football very late, he didn’t start until 16 or 17.